Robert started as a pianist with the standard repertoire, but always gave it a special and inventive turn. His own compositions are increasingly getting more self-conceited and consequently also more fascinating. He frequently performed in a trio setting, but whatever the setting was, he was clearly the leader, challenging the other members` skills to their extreme. 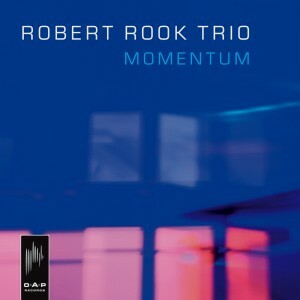 January 17th Robert Rook proved to rise to great musical heights with his fellow-players. They didn’t just improvise freely into space on a certain theme, but the tunes were well considered arrangements with lots of space to improvise. And they took that space abundantly.First to mention Robert Rook. His solos are small jewels, sometimes unpredictable, inviting for intense listening. There is a contrast in his playing: His solos are clear, with decorations that give rise to a smile. Bassist Andersen and drummer Verbeeck didn’t get as much solo space, but when they got the chance, they grabbed it in an extraordinary musical way. Such a creative pianist as Robert, who’s left hand at times is playing deceptive rhythms, can cause an extremely difficult task for his accompanists, but Andersen and Verbeeck followed him excellently, while providing a clear rhythmical flow. For those who missed this concert we can only hope that this excellent trio returns to the Regentenkamer soon again.